Welcome back to Chapter Two of the continuing play through of the second battle in the Games Workshop / Milton Bradley Battle Masters Campaign. Music this time comes courtesy of the VHS vaults. If you really like Stu Phillips soundtrack to the original 1978 Battlestar Galactica TV series you'll really like Lee Holdridges soundtrack to the 1982 Swords & Sorcery adventure movie The Beastmaster, starring Marc Singer of V fame and very loosely based on an Andre Norton novel I've never read. Apologies for the blurry photographs - the final one in this sequence isn't so bad. The Empire army positions are dictated by the scenario, while the Chaos player can position her army wherever she likes within the first two hexes at the north of the River Tengin, or is that Kwell? As the crimson orb rose from behind the hillsides, the first watchman of the west fell - the breying hordes of chaos drawing first blood, breaking the hastily defenses of the lands of Men. The great lumbering war ogre clambered through the central pass gnawing at the feeble manflesh and ignored the volleys of arrows and crossbow bolts like gnats on a aged donkeys fetid hind. The infernal mechanical deity jerked and shuddered forward vomitting forth its hideous alchemical metorite into the iron cased flesh of the Mistress of Darkness. Errupting in flame and despair, her eldritch soul blasted back into the eddying dust from which it had spawned. Yet still the great hordes of Darkness held strong, slaughtering the Knights at the Eastern Ford, their rusted iron turning the river Tengin red with the blood of Men. Slowly the denizens of darkness wore down the weary manflesh with axe and sword and spear, until finally only the great iron demigod, bringer of thunder and devourer of the Daughter of Hel remained. Yet the gods of war smiled not upon that idol, and despite it's lurching and roaring, not one of its sulpherous projectiles reached the remaining emissaries of darkness. In disarray and despondency the cult of iron surrendered, abandoning their infernal engine. The forces of reason once again vanquished before the gibbering hordes of Chaos. The game took 1 hour 20 minutes, and after an initial fun start was somewhat of a grind, not helped by the fact the Beastmaster soundtrack is quite short, and extremely repetitive. Again luck dominated the game with the Canon making only one hit - albeit in a narratively satisfying one, utterly destroying Gorefist. 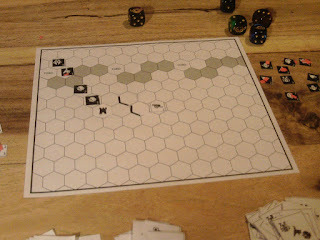 The terrain bottlenecking combat, while perfectly reasonable, especially at river fords, when combined with infrequently activated units (looking at you, Orcs) in the strategic spaces really made this game drag. As a sidenote, I have a feeling that many players responding to this phenomenon would decide the game was broken and should be rewritten to fix this problem - perhaps friendly units could pass through each other, or Orcs could activate more often. Of course, it isn't the game systems fault, it's not broken at all, it's just a tactical error by the player that would have been lessened by placing a more mobile unit in that critical space. The difficulties of manoeuvring large bodies of troops through terrain is a large part of what ancient/medieval historical and fantasy wargaming is really about, and I'm really happy that Battle Masters, despite all its simplicity retains some aspect of that. Activations is the number of times the unit appears on the Battle Cards that are drawn for troop activation, and Frequency is that number as a percentage of all that armies moves - so each turn has that percentage chance of that unit moving. As an update to Battle Masters: Pocket Edition I might put the frequency stat on the Unit token as a reminder of how often the unit gets to move and/or attack. Also found that the Empire Man-at-Arms unit icon and the Empire Crossbowman unit icon are too visually similar at small sizes and after a few ales and battle casualties which icon represents the Chaos Lord and which are the Chaos Champions are not particularly memorable. It doesn't make the game impossible, just creates a bit of dithering and narrative uncertainty that could be ironed out with some more expressive graphics - "feather hat guy facing left" and "feather hat guy facing front" don't really communicate "archer" or "crossbowman" very well either. 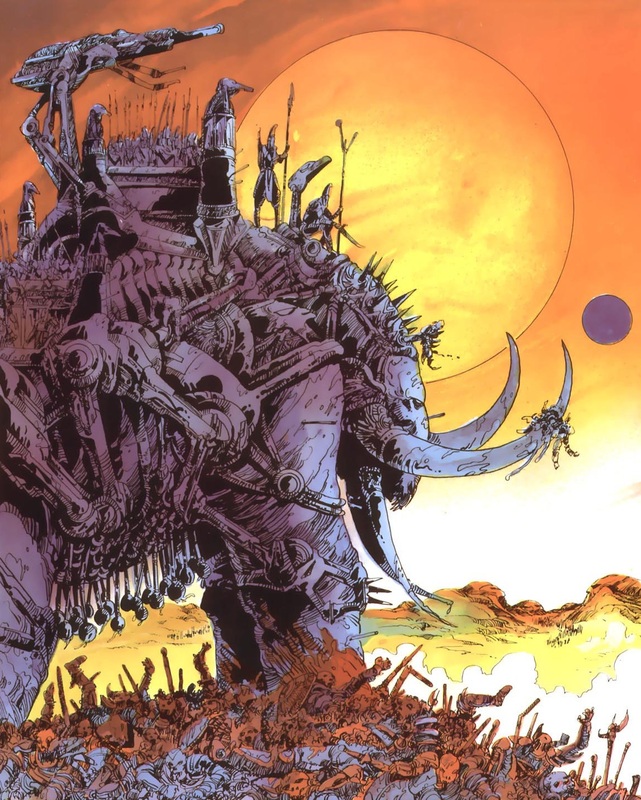 Keep thinking the Ogre is a War Elephant in Middle-earth Drag, and the Chaos Archers are effectively slingers and the whole thing is like something out of the Punic Wars. But that's probably just some external reading bleeding in rather than the designers inspiration or intent, but an interesting direction nontheless. Strategically, positioning cavalry, supported by ranged troops positioned behind then at the fords would have created a much more effective meat-grinder. Notably this is very similar to the only real strategy involved in Battle Masters predecessor Heroquest, where doorways are used to bottleneck the onslaught of dungeon dwellers. Thinking a little about developing Battle Masters Pocket Advanced into a richer Fantasy Battle Game, adding magic such as healing or an additional attack dice within range of a spellcaster could be interesting, as could some kind of Morale mechanic, as otherwise the loss of the Lords isn't as dramatic as it could be - this could be a frenzy, perhaps a Full Army move with +1 attack dice for the Chaos side, followed by a -1 attack dice to represent them subsequently falling into disarray. Perhaps the Empire would have to roll before activating to reflect the lack of command, or if we go with the hand of cards idea mooted earlier, perhaps drawing a limited number of cards. Another note for Battle Masters Pocket Advanced would be implementing a saving throw differential, so perhaps troops that don't have shield icons don't have a saving throw, and perhaps there's a 5+ save as well for heavily armoured troops. Great report once again! The description of the cannon destroying Gorefist is particularly memorable! I think you should write all future reports in poetic verse, though, with the same metre as the TV advert. Trouble is, the only thing that rhymes with "Tengin" is "penguin", and there aren't many of those in Battle Masters. Unless one of the Chaos Beastmen is in the form of a penguin?! On the subject of Gorefist's death, that does present an interesting narrative element. The Chaos side won this battle, but they lost their general. Does this mean they abort their campaign, or press on without her? 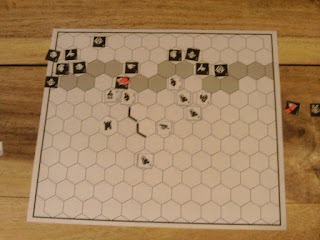 Your comparing the Ogre with a War Elephant is interesting as I was wondering the other day how to keep the basic rules intact, including the composition of the units, but "re-skinning" it with another fantasy (or even historical) setting. If we were, for example, to say this is actually a conflict that takes place in Middle-earth, the Chaos side could easily be an army from Mordor with Haradrim allies. It would be easy enough to say the Empire are the Free Peoples, though I am not sure what I would replace the Mighty Cannon with, as I'm not aware (off the top of my head) of any heavy artillery or war machines of any kind used by the Free Peoples. Glad you enjoyed it Douglas. Standard Games Dragonroar RPG has axe wielding killer penguins, and war hedgehogs. Magister Militum still sells the minis. The essence of the canon, "random destruction at a distance" does only really surface as a feature of warfare in the early-modern period. The Orcs do have blackpowder weapons at Helms Deep, but they are hand planted bombs rather than fired across the battlefield. Something similar to Gandalfs fireworks perhaps, but it's unlikely he'd allow the death by friendly fire that the cannon does. Swapping it out for a less destructive random element, perhaps Beorn (much like the ogre) or the Eagles swooping down (randomised target attack). Oh yeah, Beorn would be perfect to replace the cannon for a Battle of Five Armies setting, especially as he is something of a law unto himself. The cannon ball's path would essentially reflect him charging across the battle-field, trampling anything his his path. I guess the one big difference is that, after his charge he would effectively "re-locate" to the end-point of the charge? I'd just have Beorn behave exactly like the Ogre, not sure the mental image of him jumping 6 hexes quite works for me. In game terms I think the totally random effect is the only balancing attribution between the cannon and the ogre. lol! the 45 minute pub lunch game sounds like a definite design goal, and more like the first scenario. We played this at a fairly fast rate, but it probably would have been much quicker had the Chaos player not got bottlenecked by poor placement of the slow moving Orc unit.